The Pugger-Mixer is a unique self-unloading clay mixer with pugmill output. It recycles scrap as well as mixes from dry powder. Complete processing of your clay in one machine saves you space, money, and best of all, your time. 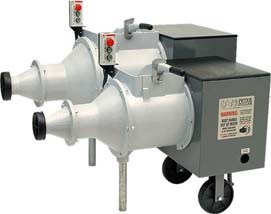 Batch Mixing: Batch mixing and blending capacity allows for thorough mixing and moisture adjustment before pugging. Push Button Controls: The MIX/PUG/STOP buttons are mounted forward so they can be reached from the operator's side of the machine during loading or from the nozzle during extruding. High Quality, <?xml:namespace prefix = st1 ns = "urn:schemas-microsoft-com:office:smarttags" />Heavy Duty Drive: The industrial rated electric motor, close coupled to a gear reduction transmission, is the highest quality available. Overload protection is provided in the magnetic motor starter. On Wheels: The PM-50 and PM-100 come with 8" diameter wheels. They are easily transported for cleaning or storage. Enclosed Drive: A frame of welded steel plate supports the auger shaft and encloses the drive for protection, cleanliness and safety. A cleanable work surface is provided on top for operator convenience. Large Hopper: The large hopper door allows for easy loading of large chunks, scraps or dry powder. Pugmill Output: Switch to PUG after a batch is completely mixed and the Pugger-Mixer unloads itself in the form of round compacted logs. Stainless Steel: Shaft, augers and paddles of stainless steel, along with aluminum mixing and pugging chambers, insure clay processing without iron contamination. Pugging Rate*: 1200 Ibs. per hr. *Mixing/Pugging Rates: Capacities vary depending on clay condition, type, moisture, etc. ** Motor: 3 Phase, 50Hz and other motors are available by special order.